(Phys.org)—NASA's Mars rover Curiosity completed a touch-and-go inspection of one rock on Sunday, Nov. 18, then pivoted and, on the same day, drove toward a Thanksgiving overlook location. 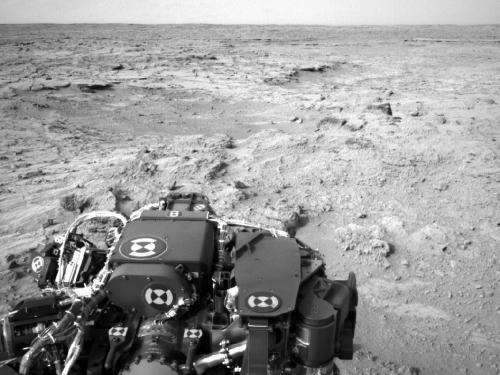 Last week, Curiosity drove for the first time after spending several weeks in soil-scooping activities at one location. 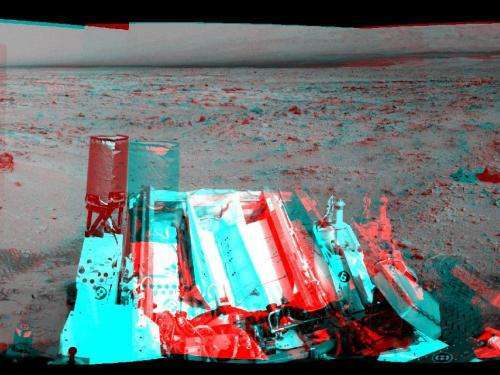 On Friday, Nov. 16, the rover drove 6.2 feet (1.9 meters) to get within arm's reach of a rock called "Rocknest 3." On Sunday, it touched that rock with the Alpha Particle X-Ray Spectrometer (APXS) on its arm, and took two 10-minute APXS readings of data about the chemical elements in the rock. Then Curiosity stowed its arm and drove 83 feet (25.3 meters) eastward toward a target called "Point Lake." "We have done touches before, and we've done goes before, but this is our first 'touch-and-go' on the same day," said Curiosity Mission Manager Michael Watkins of NASA's Jet Propulsion Laboratory, Pasadena, Calif. "It is a good sign that the rover team is getting comfortable with more complex operational planning, which will serve us well in the weeks ahead." During a Thanksgiving break, the team will use Curiosity's Mast Camera (Mastcam) from Point Lake to examine possible routes and targets to the east. A priority is to choose a rock for the first use of the rover's hammering drill, which will collect samples of powder from rock interiors. 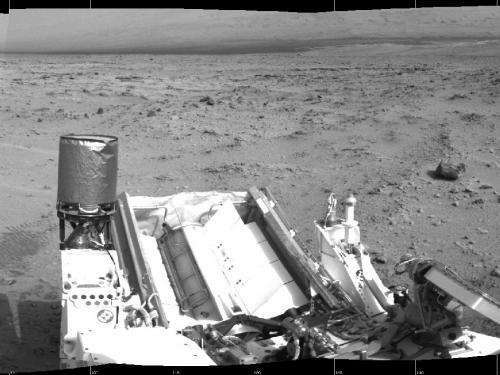 Although Curiosity has departed the Rocknest patch of windblown sand and dust where it scooped up soil samples in recent weeks, the sample-handling mechanism on the rover's arm is still holding some soil from the fifth and final scoop collected at Rocknest. The rover is carrying this sample so it can be available for analysis by instruments within the rover if scientists choose that option in coming days. JPL, a division of the California Institute of Technology, Pasadena, manages the Mars Science Laboratory Project for NASA's Science Mission Directorate, Washington. JPL designed and built the rover.